If you have a clicking, popping, or aching jaw, you may find relief from TMJ treatment in Jacksonville. At Dental Center of Jacksonville, you can count on the expert advice you need for help with sudden pain management as well as a long-term solution in splint therapy. Schedule an appointment to discuss your symptoms with Dr. Patel. But first, what is TMJ? And how do you know you have it? Let’s take a closer look at these and other questions related to your aching jaw. The TMJ, or the temporomandibular joint, is the hinge that attaches your lower jaw to the base of the skull. It is a complex network of ligaments and nerves -- and when something is off with its alignment, the jaw usually clicks, pops, and hurts upon opening and closing. Problems with the alignment of the TMJ often occur due to facial trauma or injury, stress-related jaw clenching and teeth grinding, and issues with the alignment of the teeth. The condition is known as TMD, or temporomandibular dysfunction, but is often referred to as TMJ. If you have problems with the alignment of your jaw, you are likely to notice a click, pop, or grinding sensation when you open and close your mouth. You may feel discomfort in the jaw after speaking or singing loudly for an extended period of time. Some people experience the sensation of lockjaw as a result of the condition. Difficulty eating and chewing may occur as a result of TMJ/TMD, too. 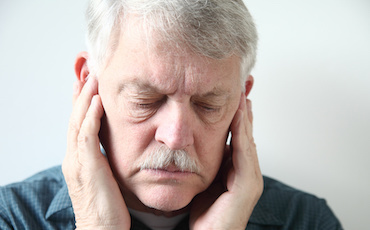 Facial, neck, and ear pain as well as tingling extremities all accompany jaw trouble. If you suspect you or a loved one are dealing with a misaligned TMJ, do not hesitate to seek treatment. 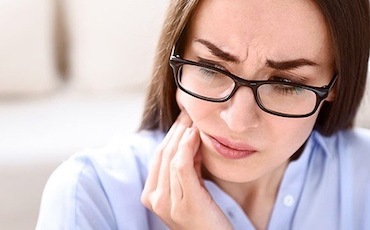 Relief from an aching jaw joint can be found when you partner with your dentist. At Dental Center of Jacksonville, Dr. Patel treats TMJ with splint therapy. This common method uses a small device that resembles the type of mouthguard athletes wear. It works by allowing the muscles and ligaments in the TMJ to relax, taking pressure off the jaw and relieving pain. For patients who also grind their teeth as a result of their TMJ/TMD, the splint provides a guard to protect the tooth enamel from wear and pressure. There are some things you can do at home to relieve your aching jaw, too. Patients whose TMJ/TMD is caused or aggravated by stress often find that exercise, meditation, and other stress-relieving activities can help. Dr. Patel will also provide you with nightly exercises to remove pressure from your TMJ. Taking an NSAID, or nonsteroidal anti-inflammatory drug (like Ibuprofen, or Advil, Motrin IB, etc. ), as directed provides additional pain relief for TMJ/TMD. Do not delay seeking relief for your aching, popping, or clicking jaw. TMJ therapy takes pressure off your jaw so you can eat, speak, and sing without pain once again! Request an appointment with Dental Center of Jacksonville today.